Above: My parents, Panagiotis and Eleni, with my sister Myrta and her daughter, Vasiliki. Above Right: With friends at Easter. 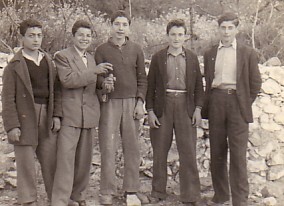 L-R: Konstantinos Takidellis, myself, Ioannis Avdelellis, Koulountzis and Athanasios Kapatos. Above: With friends. 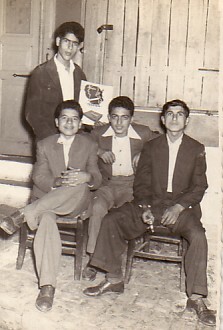 L-R: Dimitrios Kikidas, myself, Konstantinos Takidellis and Vasilios Bougias. 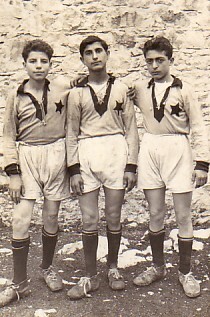 ASbove Right: Playing for Agiassos Asteras (1957-58). 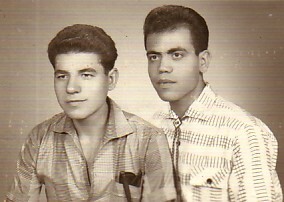 L-R: myself, Vasilios Bougias and Kostantinos Takidellis. Above: Coming back from spraying the olives groves. I am fourth from the left. 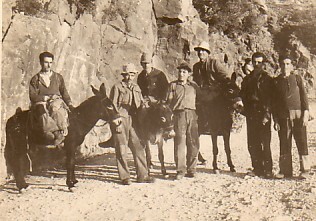 Above Right: At the panygiri of Agios Dimitrios. 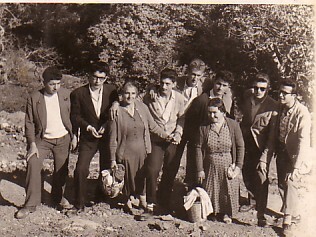 L-R: myself, Themistocles Hatzinikolaou, Eleni Hatzikomninou, Kostantinos Raptis, Dimitrios Koudourellis, unknown, Marigo Evangelelli, Efstratios Bouras and Vasilios Kolomondos. Above: With Nikolaos Psiroukis in Athens; this photograph was taken before we left for Australia.